Our team is very excited about raising funds to build a Universal Playground at Jefferson Elementary School in Guilford County, NC. The students at Jefferson were upset when they realized all of their friends couldn't play together on the playground. Although ADA approved, the students with walkers and wheelchairs face challenges moving around freely on the mulch. This video displays how passionately our students have rallied together with letters, posters and bracelet sales to create an amazing vision of unity. Please consider donating to our playground to assure recess is fun for all our students! Our frozen account is live again! Join us Sunday from 2-5 pm at LeBauer Park for UNITE downtown Greensboro! Jefferson will be hosting a table with staff and students available to share our vision! Check out our long term vision! Phase one will include rubberized surface on our existing playground so all students have access! We've raised over $1,000!!! Thanks to everyone for their generosity! We are working on reaching phase one - Universal Playmaker Uprights ($80,000). Then we'll add on with a Unity Rock ($5,000), a Unity Dome ($12,500) awesome sensory panels ($3,000) a Cozy Cocoon (2,500) and the super exciting NEOS 360 Accessible! ($25,000). 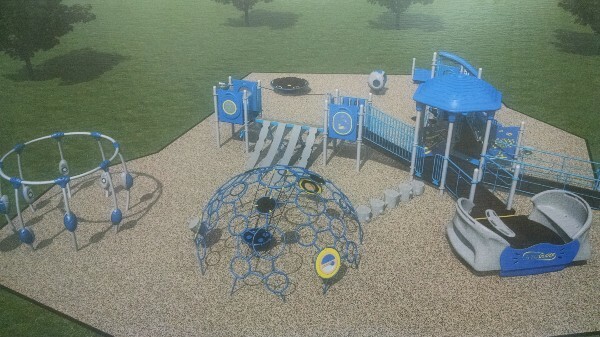 Our last two phases of fundraising include the pour in place for the new playground ($50,000) and pour in place for our existing playground ($100,000) to unite the two and create a truly universal playground where everyone can play together! Please keep sharing our link! $700 in two days, we're off a great start!! Thanks for supporting our playground!! Thank you to everyone that has donated. We REALLY want to be able to complete phase 1 of this project by the end of this school. Phase 1 will put the rubber surfacing on our current playground so ALL students can access our current playground! Kids caring for and helping other kids. Love it! Wonderful project! Thanks for all you do to help our students/children with different needs! !